Cat's Eye is the life's story of Eileen Risley, a reasonably successful feminist-post-something-or-other painter who is returning to her home-town of Toronto for a retrospective of her work. Alone in the city she once called home, Elaine reminisces vividly about her childhood. Set between the Second World War and the late 1980s, young Eileen spends most of her younger years trawling the Canadian woods, camping out and cooking over open fires with her etymologist father, outdoorsy and independent mother and war-game enthusiast turned physicist brother. Eileen has never considered her upbringing to be anything other than normal, never even thought about it. When she is 8, her father gets a job in the local University and Eileen and her family move into a long term house for the first time. She goes to school on a permanent basis and meets a friend called Carol, who finds Eileen fascinating, marvelling at all of the things that she has never seen or experienced before..exotic items like Twin Sets and dining room tables. Then along comes pious but beautiful Grace. Then Cordelia, mature and mean. Eileen's unconventional background kind of singles her out- compared against her 3 friends she seems unfeminine, uncouth, heathen almost. Having spent so little time in the company of girls Eileen worries about how to behave, about not having a hat or a little purse. Sensing something 'other' and honing in on an exposed weakness, Cordilia, Grace and Carol mercilessly bully Elaine, who's just desperate to be accepted, to fit in and act a part that the others play so easily. After a relentlessly heartless campaign of emotional torture and following a cruel prank that veers close to tragedy, Eileen realises that she has been almost a complicit victim, hungry for their approval and so lacking in courage. She makes a decision to stand up to them for the first time. After Eileen's resolution to detach from her poisonous friends, the narrative jumps from her childhood to High School, where she re-establishes her relationship with an altered Cordelia. The balance of power has shifted and Elaine finds that she is the one who does most of the taunting these days, becoming notorious for her cruel mouth. We also see her early adulthood, her years as an art student struggling to forge her own identity, as a burgeoning feminist made to feel guilty for her stable, hetero relationship, her affairs with other artists- she claims to find brotherhood easy, but sisterhood a mystery. We see her career take shape, her marriage, her children. She always struggles to form stable relationships with women, right through adulthood and up to her return to Toronto. She is haunted by the spectre of Cordelia, last seen in a mental institution following a failed suicide attempt. She looks for her wherever she goes. The theme of memory and forgetting runs through the book- Eileen seems to forget, in later life, things that she imparts to the reader with such precision. She forgets her childhood misery, forgets the beloved photo album in her cedar trunk. She forgets about the time her friends nearly killed her and about the beautiful Cat's Eye marble stashed away in her church purse. Cordelia forgets too- she's engineered a whole new childhood for herself were she and Eileen were best friends and Grace was the odd kid, with her piousness and her boring furnishings. Totronto itself forgets- it forgets that nothing is supposed to happen there, that it's supposed to be boring and old fashioned. 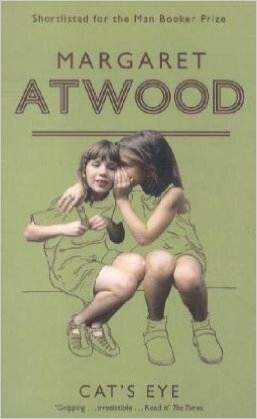 Atwood writes women beautifully. Obviously. But her best female characters are the ones that stand at the feet of thresholds. Here we have Elaine on the brink of adolescence- unsure, self-conscious and living in mortal fear of slipping up, of doing the wrong thing. We also have late middle age Elaine, two marriages and two grown up kids under her belt returning to Toronto for a retrospective of her art. She is at the tail end of her career, on the threshold of age and irrelevance. I love Atwood's bitter, older women- the finest of them all being The Blind Assassin's Iris . They way that she describes their feelings of detached displacement; the world has moved on without them, things that were once so solid and dependable are gone, replaced by odd trends and new, patronising young people that wear weird clothes. Notions like making do, or persevering are alien, scorned by the younger generation. Eileen wanders through a strange city, failing to find anything familiar in the gentrified, trendy downtown areas. I absolutely loved this book. I thought Eileen was a fascinating narrator, and the reader squirms with shame and embarrassment for her, unable to confront her torturers and be herself. I love how Atwood's women are all pioneers; all hacking a path through oppression and patriarchy, fighting to build their own characters. I love how she shows their workings, the rough drafts of 'self' that each character goes through, For Eileen it's the acquisition of a Sunday School outfit, preppy skirts in High School, the turtle necks, Marijuana and severe centre partings in art school. She takes some time to work out who she is and it's fascinating to watch. I think every reader knows what it's like to feel unaccepted, to try so hard to fit in or have imposter syndrome- but it takes half a lifetime to realise that it was all so pointless, that everybody is pretending and that the popular kids are all imposters too. It takes maturity and age to realise that you should have been better than that. Margaret Atwood is a hero. I could read her books forever, and nothing captures my attention quite like her prose does. If you loved Cat's Eye, which, let's be honest is kind of a given, I'd definitely recommend the Blind Assassin, by Margaret Atwood, for more childhood to old age narratives of misery, identity confusion and bitterness, The Ecliptic, by Benjamin Wood for another spellbinding story of a life of art and memory and The Summer of Secrets, by Sarah Jasmon which looks at idealised childhood, memory and being haunted by past friendships.